What do you think? Hutos - The Flying House is a new show made for preschoolers. It is made here in Korea and broadcast on KBS. This subway advertisement showcases the main characters. Do these characters strike you as very similar to another international hit show for preschoolers? Here's an abstraction of the main characters into basic shapes and colors. Don't they seem awfully familiar to you? Tell me what you think in the comments sections. I'll add more about Hutos to this post later. UPDATE (March 15th, 2008): The similarities between Hutos and Teletubbies are not coincidental. 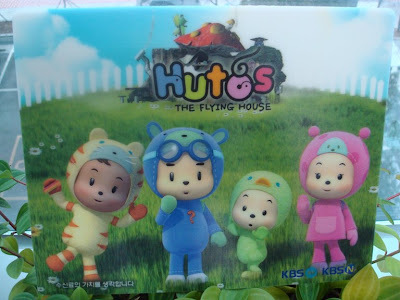 Hutos is intended as the 'Korean Teletubbies'. The first obvious similarity is the character design. The characters are very similar colors as well as other design elements. The second similarity is in the structure of the show. It is undeniably like the Teletubbies. It is set in a beautiful nature reserve and they live in similar eco-friendly structures. The previews for this show even feature the characters posing in the same ways as Teletubbies and speaking baby talk as Teletubbies do. Although, in the actual show, a major difference is that the characters speak full sentences in Korean. And a further difference is that the show features music videos and animated segments (not beaming from their bellies). Teletubbies is a proven international success, so Hutos need not reinvent the wheel. The similarities between the two shows helps audiences (parents) and global investors know exactly what to expect from this property. 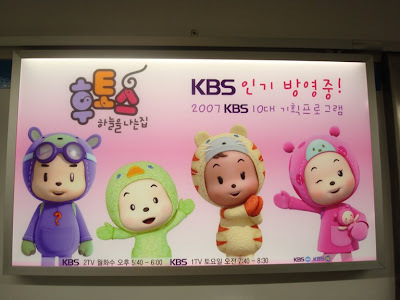 Teletubbies rip-off or not, at least a Korean television program is gaining international interest. And anyways, nothing is ever completely original and it's not EXACTLY like Teletubbies. People may criticize Hutos as a blatant rip-off. Is there a need for a Korean Teletubbies? There already is Teletubbies, so why bother with Hutos? With all the financial backing for Hutos, the lack of originality is a missed opportunity for Korean talent to truly shine. Hutos is a cute show that will likely have success on its own merits. The show looks beautiful. And, the heavy marketing can't hurt it either. However, will the Teletubbies similarities hurt or harm it? And what does Hutos reveal about the state of the Korean animation industry? Please share your thoughts. In the subway advertisement, it is not as obvious. But in your abstraction, I would say they look a lot like TeliTubbies without the TV screen bellies. It just looks like Teletubbies. The color remind me of them. I don't mind colour coding characters for new generations... we can't let someone argue they own the right to colours. Sesame street has been color coding since the early seventies and now the Wiggles do the same thing and make around 50 million bucks per year from it. I believe the idea began with the different coloured Thunderbirds in 1964 as imagined by Gerry Anderson. Prior to that, Anderson was making characters that could have all been wearing the same coloured costumes because there was ONLY black and white TV. The Japanese became obsessed with the Thunderbirds as soon as it was shown on Japanese TV- the fanatastic individual vehicles performing exciting and unique tasks appealed to the Japanese mentality. In 1972 the Japanese launched the Ninja Science Force (Gatchaman) or 'Battle of the Planets' as we got it in the West. The differing characters all had their own bird colours and individual identity. Some thoughts on some issues here. The Rock band Kiss now have two new younger members dressing up in the make up of the original band- thus KISS could survive for as long as Rock and Roll survives with injections of new members to keep the masked characters of Lizard, Cat, Space man and Love junkie going. This same principle applies to animation: Old ideas become new with the injection of youthful vitality and new technology. I just updated this post. Thanks for sharing your thoughts. I think it looks like Teletubbies, too, obviously. Alex, as always, you raise some good points. I'm a huge fan of color coding! In fact, I think families and friends should even apply it to their own lives, ha ha! Color coding is nothing new and is perfect for preschool programming. And it's also good to regenerate old concepts with fresh ones, even if they are very similar. 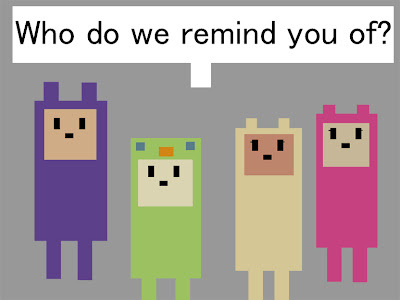 However, according to a co-worker, this show is definitely intended to be the Korean Teletubbies. The first episode I watched of this show was VERY much like the Teletubbies, but the current one I'm linked to in the post is more original. I think the similarities is a good marketing strategy. However, the world of preschool programming is full of such strong brands (Thomas the Tank Engine, Barney, Teletubbies, Dora, Yo Gabba Gabba, The Wiggles, etc.) that I think Hutos will need more originality to really stand out. Why choose Hutos when you can choose Teletubbies? Nice website Midodok! We miss you! Take care! Hutos aren't cuter than the pictures of Higgy I've seen! I like your blog, but I don't think it's focused. People don't find much about Korean animation here. You see, there is a severe dearth of coverage/interest/fan-created contents on Korean manhwa & animation. We see the web overloaded with anime wallpapers & fan fictions, etc., but none or very little of them exist for Korean manhwa. There were recently very great Korean animation productions such as Yobi: The Five Tailed Fox & Oseam, etc., but I don't think you covered them. I'm just offering a constructive criticism. I don't know you. You don't know me. For the same reasons, I quit my previous blog, flavcorn.blogspot.com. It was getting significant amount of traffic, but it wasn't focused on anything & it wasn't getting the regular followers/readers/visitors/wateveruwannacalldem. I should compliment you and the entire team that is working on this Blog and wish to create creative space in the youngsters. I am amidst a situation where I too wish to train on the art of animation and gamming to our youth, can you support this very noble cause? We have the world’s largest population on the youth front, by 2025 our youth will be 30years of age, but the time to prepare for it is now and the catch is 70% of our children are more computer driven. As a director of a College of Animation Studies and Research (P) Ltd., based in Navi Mumbai, keeping the above factors in mind we as CASR have planned to affiliate with Hongik University which is situated in Seoul, South Korea. They have an animation degree course and students who undergo the tenure get groomed as a full fledged animator, our children are highly potential if an appropriate syllabus along with the right mentors; collaborate together, as said earlier the time for us to get set is now. We request you to kindly support us in getting the affiliation, a recommendation from the Bharatiya Ambassador of Bharat (India) to the Republic of Korea; Shri Skand Rajan Tayal, shall boost up this major concern. We are getting set on organizing for a recommendation from the consulate and the embassy of republic of Korea in Bharat; in a week’s time. Kindly help us out in making our country rise above the one’s who looted us and tagged us as a third world country, which it never was, for any further information you need to understand about us please write to us, we have taken up the responsibility of bringing home the world’s best animation training along with their mentors, who have passed the same curriculum. though the colour is the same but it's so different from Teletubbies! Hutos is way to cuter than Teletubbies. OMG.i love ara! wow.. they are so cute..
wish i had a collection of them..